I have learned so much about who God is through writing this series of devotionals. Our God is truly EVERYTHING that we will ever need in this life. I am so grateful that we have a loving God that shares His names with us so we can call on Him in any situation, at any time. He has a name that we can call on for any circumstance that we may find ourselves in. I chose 6 for this devotional series, but there are so many more. He is all powerful, all knowing, everywhere at every moment. How GREAT is our God! How AWESOME is our God! 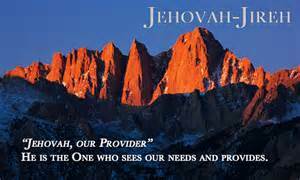 Jehovah Jireh is the God of provision. As a single mom, there have been so many times when I didn’t know how the bills would get paid and how I would provide for 5 kids. I often called out to God to provide. Jehovah Jireh heard the cries of my heart and has ALWAYS provided. 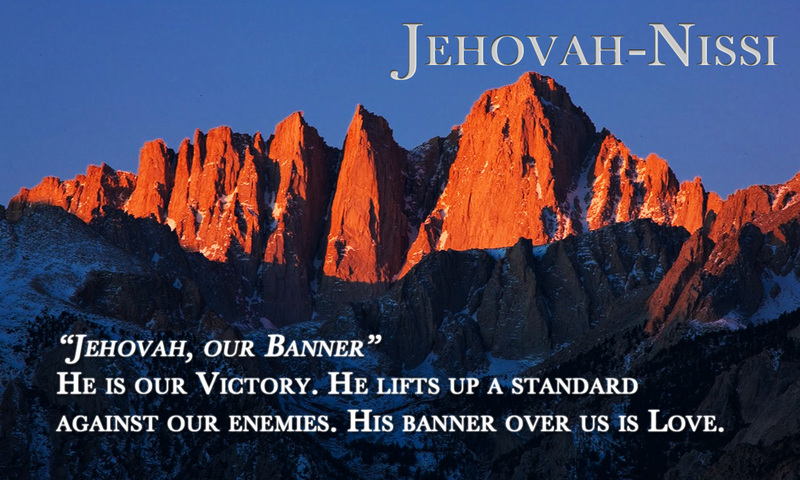 Jehovah Nissi is my banner. It doesn’t matter what battles I face in life, God is my victory. Jehovah Rapha is my healer. He heals me physically, emotionally and spiritually. I had pneumonia for 6 weeks in 2006. I was caring for 5 children 13 and under. I struggled through work until the doctor told me to stay home or she would put me in the hospital. I didn’t have the energy to crawl through my day, much less take care of 5 kids. In my illness, I cried out to my healer and Jehovah Rapha answered. Jehovah Shalom is my peace. In this chaotic world, we need a corner where we can find peace. God has been that peace for me. Jehovah Shalom, my peace in a messy world. 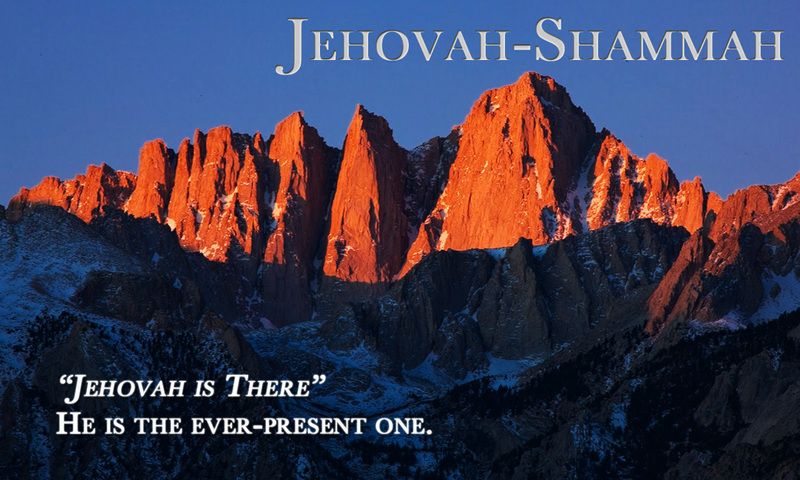 Jehovah Shammah is always there. It has been such a blessing to know that God is everywhere we go, knows everything we face and will never leave us to struggle alone. 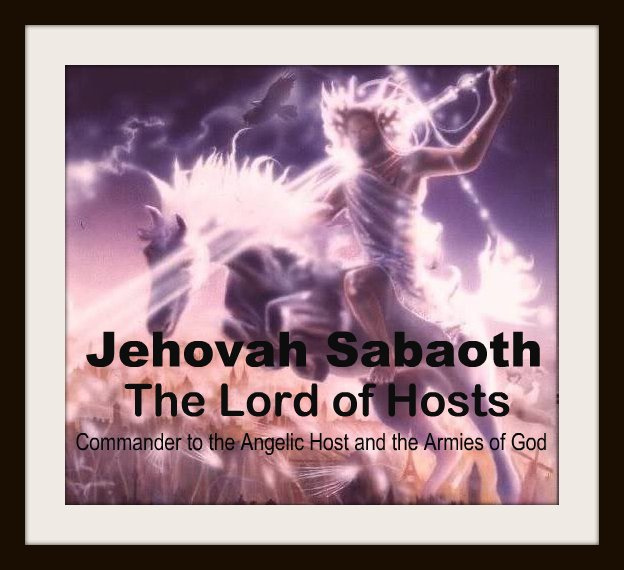 Jehovah Sabaoth is the Lord of Hosts. I have faced battles in my life. Battles against other people and spiritual battles. I serve a God who is the commander in chief of not only heavenly armies, but also earthly armies. Nothing happens without His approval. When I cry out to Him in the midst of a battle, Jehovah Sabaoth answers and fights for me. I pray that this devotional series has encouraged you. 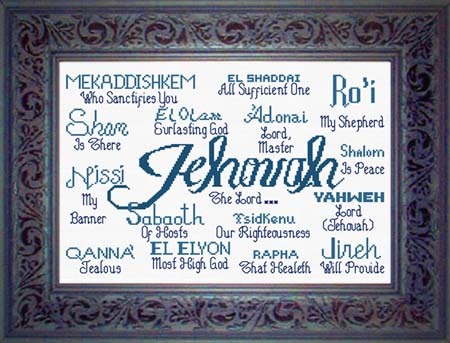 These are not the only names of God. I encourage you to research on your own, make a list of all the names of God, and use those names in prayer when faced with a tough situation. I would also encourage you to use a journal to write down what each name of God means to you in your life. This journey has drawn me so much closer to my Father. Praise His name! HE IS MY EVERYTHING! The Lord of Hosts is our Warrior. He will protect, deliver and rescue us. As a single mom, I find this very reassuring. Our God is the Lord of armies and He is willing to fight for us when we need Him to. There have been many times in my life when I was faced with difficult situations and have felt that I was in the battle on my own. I felt that everyone was coming against me and no one was on my side. I never need to worry. God always has the back of His children. I am fighting a battle with_________________ and I know I will never win this battle on my own. I need you! I need you to fight for me. I surrender this battle to you, Lord of Hosts. I know you have my back. I praise your name! I thank you for hearing the cries of your children. I thank you for coming to the rescue of your children. I need you now. You are NOT in this fight alone! If you need me to pray with you or for you, use my contact page and I will get in touch with you. With God fighting for us, we need not worry. Nothing in heaven or on earth can ever overpower our Lord of Hosts! When I first realized that my marriage was coming to an end, I was overwhelmed with a feeling of abandonment. I felt completely alone. I felt like no one cared about what happened to me. At that point in my life, I did not feel the presence of God. I felt like everyone had left me, including God. I know that God never left me and never will. He is my Jehovah Shammah, always there in the midst of our heartache and pain. Life is full of loss. There is no way to get around it. At one time or another, we will ALL feel loss in our lives. In the midst of that heartache, our Lord IS there! If you are dealing with a loss right now and feel like your heart is breaking into a million pieces. If you feel abandoned by those that you love, know that our heavenly Father is right there beside you. He will never abandon you. He will never leave you to handle your pain alone. Cry out to Him. Let Him know how hurt you are. He is waiting. Thank you for being The Lord Who Is There. I am feeling so hurt and abandoned right now. I don’t know how I will ever go on on my own, I feel paralyzed by fear and my heart has been broken. Help me, Jehovah Shammah, get through this pain that I feel. I am surrendering the hurt and the pain to you. I acknowledge that you are here with me. I am not alone. You ARE here. I praise you, Lord! If you are feeling overwhelmed by loss and the broken heart of abandonment, please remember that you are NOT alone. Let me know how I can pray for you. You ARE special! God loves you and will NEVER abandon you! Not only did the Lord save Israel out of the hands of the Midianites, He did it with only 300 men! Gideon must have thought God was crazy when He told Gideon his army was to large. He must have felt that he was crazy when he faced the Midianite army with only 300 men, but he obeyed God and God gave him the victory. Gideon faced an overwhelming battle, but he walked in the peace of the Lord, knowing that God was with him. Gideon could have run in fear. No one would have blamed him. Instead he chose to trust God to fight the battle with him. He knew God’s peace. In my life as a single mom, there have been many times when I have struggled to feel the peace of God. I have dealt with overwhelming anger, fear, bitterness, and the list goes on. Peace alluded me, until I found my Jehovah Shalom, my God of peace. My life still gets crazy and sometimes I do still feel overwhelmed, but I know I have a God of peace who is willing to walk this out with me. If you are feeling overwhelmed in this season of life, know that we have a God of peace willing to give us the gift of peace. All we have to do is ask! My God of peace! I am feeling so overwhelmed right now. I feel chaos and stress around every corner. I hunger for the peace that surpasses ALL understanding. I want that peace in my life that comes only from you. I know that it is a gift and I only need to ask and open myself up to receive. I am surrendering everything in my life that is overwhelming me and keeping me from feeling your peace. I am letting go of that control that my circumstances have on my life and I open my heart and my mind up to receive that peace that only comes from you. I accept the gift of peace and I trust you to walk this out with me. Thank you Father for the gift of peace! If I can pray for you, or guide you along the path to peace, please contact me! I am here! How reassuring to know that we have a God that heals us! In my life my Jehovah Rapha has healed me from fear, a failed marriage, and anger. Not that I don’t sometimes feel fear or anger, but they don’t control me like they once did. I am opening my heart to you, Jehovah Rapha, for healing. I am opening my body to you for healing. I open my spirit and my mind to you for healing. I am struggling with_______________ and need healing, Lord. I know that your healing is a gift and I let go of my hold on this issue and open myself up to your love and healing. I thank you and I praise you for the healing that is already taking place. I give you ALL the glory! God can heal EVERYTHING! Addictions, a broken marriage, a chronic illness, a mental illness, spiritual issues, etc. God can heal it! You are never alone in your struggles. Jehovah Rapha is ALWAYS with us! Contact me if I can pray for you. I am here for you, sister friend! I am dedicating this post to the courageous women of the Dove’s Nest Recovery Home in Charlotte, North Carolina. 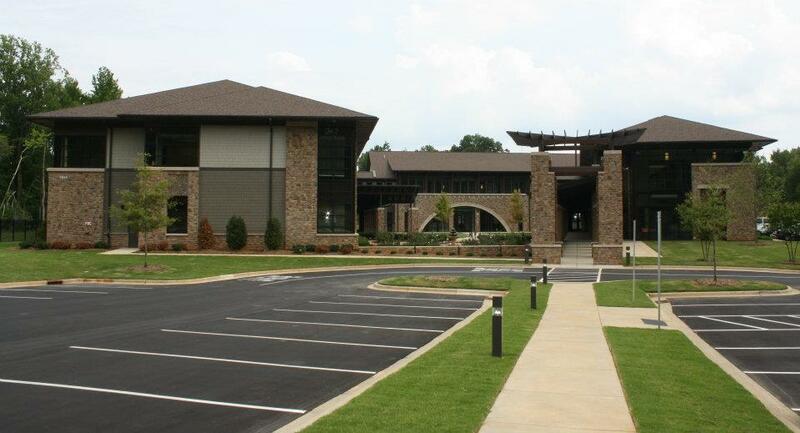 The Dove’s Nest is part of The Charlotte Rescue Mission. I found out about this christian recovery home for women through the On-line Bible Study with Proverbs 31 Ministries. These women are remarkable in their strength and determination to change their lives. For more information on the Doves Nest or to make a donation go to http://www.charlotterescuemission.org. I have faith that Jehovah Rapha will heal these women. The Amalekites had come against the Israelites and had lifted up hands against the throne of the Lord (Exodus 17:16). As a result God came against them and Joshua wiped them out by the sword. In my lifetime there have been times when the enemy, Satan, has come against me. He has used fear, low self-confidence, and lies to keep me from fulfilling God’s purpose for my life. Satan has used my past against me. I believed the lies. I believed that I was not good enough to be used by God. Over the years, the Lord has healed my heart and I no longer believe the lies of the enemy. I believe the truth of God’s Word, that I am to walk in courage knowing that God is with me. I believed God’s Word that I am loved and cherished by my heavenly Father. As Jehovah Nissi, God has been my banner. He has been the won who fought for me and won my battles against the enemy. My Lord Jesus has been my victory and has given me victory. I know in my heart that you are my banner, my victory and I give my battle with_______________ to you. I surrender it all to you and trust that you are fighting the battle for me, giving me the victory. I know that I cannot fight this battle alone. I need you to fight it for me. I thank you for giving me the victory! Keep praying and keep lifting up the name of the Lord our banner, Jehovah Nissi. You never have to fight alone. Our Father never expected us to have to fight alone. He is here to fight with us. Give it to Him and He WILL give you the VICTORY!